Transform a simple bath into an ocean of azure blue, body and soul imbued with the distinct scent of the sea. After basking together in this wondrous blend of nature's own sea salts, sea weeds and organic moisturizes, you'll emerge from the bath as Venus herself from the briny depths  skin softened, body nourished and soul reawakened to the possibilities of love. Spirited from a faraway shore, a seashell scoop and natural loofa sponge accompany each jar of bath salts. Scoop Treasures of the Sea into running bath water and let bubbles form. Sit back and relax into an ocean azure paradise. Sodium Sulfate,Sodium Sesquicarbonate, Sodium Thiosulfate, Sodium Dodecyl Benzensulfonate, Magnesium Sulfate, Sodium Lauryl Sulfoacetate, Hydrated Silica, Sodium C14-16 Olefin Sulfonate, Fragrance (parfum), Triticum Vulgare (wheat), Germ Oil, Algae, Blue 1 (CI 42090), Geranoil, Butylphenyl Methylpropional Linalool, Benzyl Benzoate. 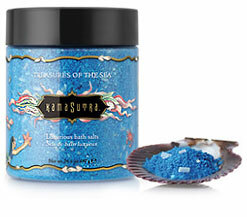 Kama Sutra Treasures of the Sea by Kama Sutra are sensual bath salts that transform my bath water into the color of the ocean and give the air an exotic fragrance much like the Aiya Napa white caves in Cyprus. The water makes your skin feel silky and moisturized from the natural oils it contains. It is also a bubble bath and the bubbles remained with me during the bath. My husband joined me and it was a sensual and lovely experience.